Member log-in required -- Non-members, guests or others who owe a registration fee should use this PDF form. Note: All guests must be physicians or medical students. The registration deadline is December 3 at 8 a.m. Residents & Dermatology Fellows -- At the request of your department chair, all residents are automatically registered. However if you are not attending, please contact the CDS office by email - [email protected] so we can take you off the list. Dermatology departments at one of the medical schools are asked to use the online form to register any medical students who will be attending. A faculty member must be the sponsor for the student/guest. Please observe the normal registration deadlines! It is your responsibility to let the medical student know the details for the meeting location and time. Guests - All guests must be physicians, medical students or research associates accompanied by a member. They need to pre-register using the paper form. The registration fee for guests is $35. CLICK HERE for a PDF copy of the form (may be completed on your computer and then printed out). Please note this important deadline: Registrations submitted after 8 a.m. Monday, December 3 are considered "late." After that time, advance registrations will be closed; please contact the CDS office if you wish to submit a late registration. DOWNLOAD the printed brochure here. 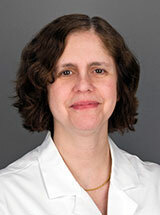 Dr. Victoria Werth is a Professor of Dermatology and Medicine at the University of Pennsylvania and Chief of Dermatology at the Philadelphia VA Hospital. She has a practice devoted to care of patients with autoimmune skin diseases. Recent studies have worked to develop a validated disease activity measure that can be used for systematic clinical studies in cutaneous lupus. This has been used in several ongoing or completed therapeutic trials. She is on the Medical Advisory Board of the Lupus Foundation of America and has been funded for her basic, translational and clinical studies related to lupus by the NIH, the Veterans Administration, the Lupus Foundation of America, the Lupus Research Institute and the Alliance for Lupus Research. CME Conflict of Interest Disclosure: The speaker's conflict of interest disclosure will be made at the time of the conference. "Cutaneous Lupus Erythematosus: New Developments in Pathogenesis and Treatment"
The November meeting take place on the 6th floor of the Gleacher Center, the University of Chicago's business school conference center in downtown Chicago. 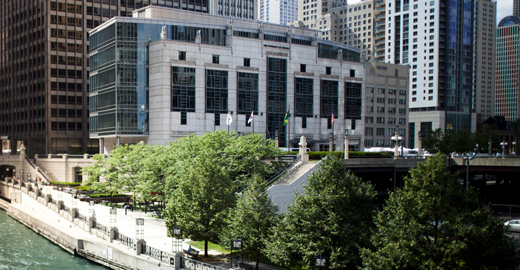 It is located at 450 Cityfront Plaza Drive on the Chicago River west of Columbus Drive. The NBC Tower is immediately adjacent to the Gleacher Center. Although we are not able to offer discounted parking through CDS, most of the parking lots nearby have attractive "early bird" pricing. So that we can better plan the meeting, please register no later than 8 a.m. on Monday, December 3. Registrations received after that time are considered late. Attendees who pre-register will be guaranteed a protocol book and lunch. Those who register late normally will receive these items, but it is not guaranteed. Target Audience: Practicing dermatologists, dermatology residents and fellows. Conference participants are asked to turn in their CME attendance form and evaluation form before leaving the meeting. A CME credit certificate will be mailed following the conference. Residents also must return the attendance form in order to be marked "present." Thank you for your assistance in this important activity.